Brush calligraphy on a rice paper scroll created by the Lochwood Library Anime Club in June 2010. Lochwood has a monthly Anime Club for kids who are interested in the Japanese art of cartooning known as anime and manga. Each meeting includes interesting new activities…and snacks! In June, club members were introduced to the art of Japanese brush calligraphy on rice paper. 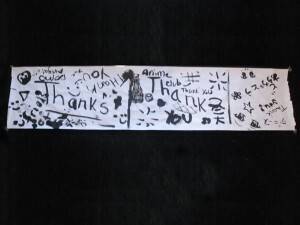 The photo shows a scroll created at that get together: it is a fun “thank-you” to the Friends group for supporting the club. LBLF donated the proceeds of a $100 grant from Friends of the Dallas Public Library to the Anime Club. During the June meeting, samples of Japanese foods were served, including sushi; a dish that was new to most of the kids who attended. The Anime Club is directed by Will Mayer. Lochwood Library has an alcove area dedicated to teens for reading and study in a comfortable, casual setting. Teen programs occur at various library locations.Dallas Library has a Teen Center page. Some events are posted Facebook at this link. 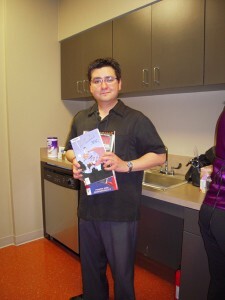 Will Mayer holding books donated to the teen program by the LBLF.